I am a sound artist and creative technologist currently concerned with augmented instruments and software development for live performance and improved accessibility. I like the idea that reconsidering access and inclusivity can have a profound effect on sound-based work. I work with organisations like Drake Music and Hackoustic, and teach experimental sound art courses at City Lit. As Ardisson I have recorded experimental dance music, acid, and somewhat more bizarre soundscapes since 1997 – including several 12″s on Seed Records. I’ve also worked extensively with members of Southbank Gamelan Players on the Augmented Gamelan project, experimenting with modified acoustic instruments in networks of sound and light. This was the subject of my recent AHRC funded PhD research at Middlesex University. 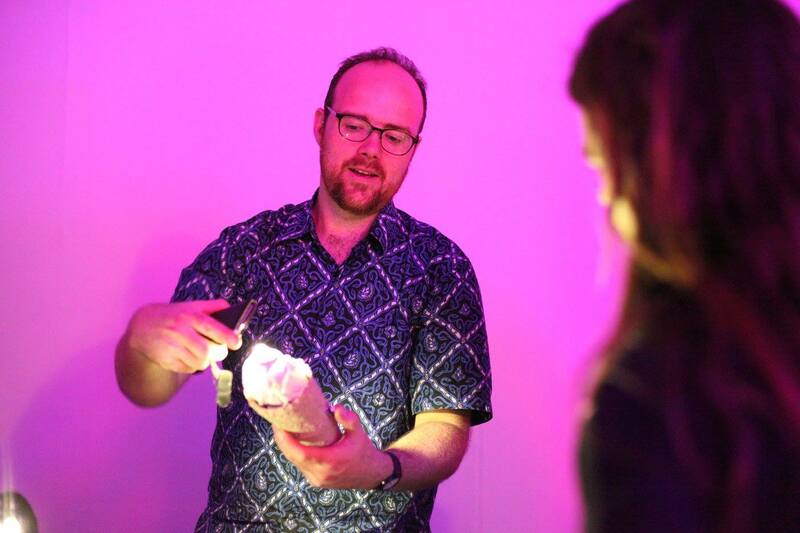 Other recent collaborative works include making sound pieces out of hand-held vibrating torches, analysis of brainwaves under the influence of LSD, and the movement of single-celled freshwater creatures. Demonstrating vibrating torches and light recorders at We Are Robots 2017. Photo by Hackoustic. Click the headings at the top of this page to explore! Creating an interactive sound installation in conversation with visitors. Interactive installation with handheld devices that detect colour and convert them to sound. Interactive installation based on transferring light patterns to vibrations. Exploring a new setup involving capacitive sensing, springs, and a slowly shifting texture built in Max/MSP. Algo-mechanical acid set including debut of the Augmented TB-303. Audio-visual chamber-style set – revisiting the material designed for the Brunel Museum as a trio. Audio-visual chamber-style set specially developed for the space of the Thames Tunnel Grand Entrance Hall. 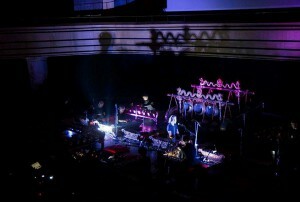 A/V performance as Augmented Gamelan, as part of a concert programme with Plaid and Southbank Gamelan Players. Interactive installation featuring Pipilan and augmented gamelan instruments. Premieres of two new works: Network for Augmented Gamelan, and 3 Films in collaboration with Charlotte Pugh. Demonstration and informal talk about Augmented Gamelan instruments and recent compositions. Panel discussion about new music for gamelan, chaired by Gillian Moore and featuring Aris Daryono and Rolf Hind. I will talk a little bit about Pipilan, a new piece of software for composing with gamelan and electronics. Short Augmented Gamelan set as part of a larger performance with Southbank Gamelan PlayersLive performance including stretched out rendition of ceremonial pieces.